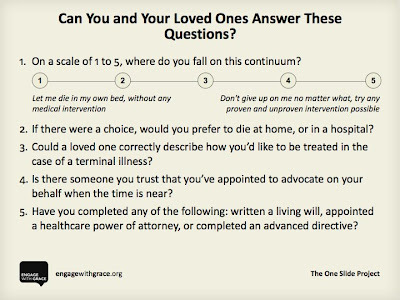 There is a blog rally going on today, trying to get families to talk about end-of-life issues while they are together during the Thanksgiving holidays. It's part of something called "Engage With Grace: The One Slide Project." Working, as I do, on a project about end-of-life care with children, it seems to me like a no-brainer to have these conversations with adults. All adults. Thanks for writing this, A. I NEED to address these issues, and I honestly haven't crossed all of my t's and dotted all of my i's as yet- after 2 years of knowing that I am going to go sooner rather than later! Shame on me. We've discussed this many times, with all of our kids, and my husband and I do have our directives as part of our trust. Fulfilling my mother's and sister's wishes of dying at home (with the help of hospice) gave and continues to give me tremendous comfort.